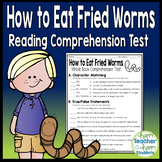 The item you are viewing is a test / assessment for the book How to Eat Fried Worms. This assessment / test is suitable for fifth, sixth, seventh, and or eighth grade or any class in need of an assessment piece for this book. 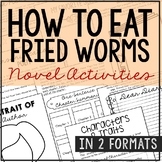 "How to Eat Fried Worms", by T. Rockwell, Literature UNIT, 67 Pages! 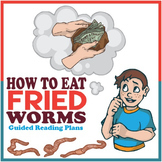 This quiz covers chapters 1 - 7 of How to Eat Fried Worms. There are 14 multiple choice comprehension questions and 10 multiple choice vocabulary questions. This is a very cute test that students will enjoy taking. I hope you enjoy. I also have one for chapters 8 - 14. 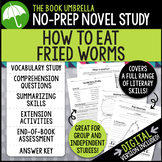 This novel unit contains everything you need to teach the novel How to Eat Fried Worms by Thomas Rockwell. 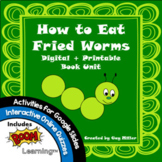 Includes comprehension and discussion questions for each chapter, pre, during, and post reading activities, comprehension test, additional research activities and other activities. 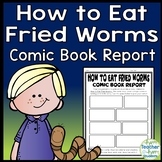 How to Eat Fried Worms by Thomas Rockwell How to Eat Fried Worms Chapter Summaries and Objective Tests This 21-page resource for teaching Thomas Rockwell's rib-tickler has two different components. 1. Chapter Summaries The CHAPTER SUMMARIES are presented in bulleted format for quick reference.